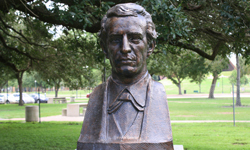 The bronze bust of Vicente Rocafuerte was produced by Amadeus Qualacio Collmann. 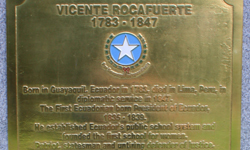 Rocafuerte was an influential figure in the politics of Ecuador. He was born into wealth and was educated in Spain. He returned to Ecuador in 1807 and was instrumental in freeing the country from Spain and, subsequently, from Gran Colombia. He served in the National Congress, as governor of Guayas Province, and as the second president of Ecuador.